This Irish baby bib with shamrocks says, I'm So Cute I Must Be Irish. This Irish baby bib is an exclusive design of The Irish Gift House. This Irish baby bib features a colorful printed design with shamrocks on 100% white cotton along with Kelly green trim and neck snaps. 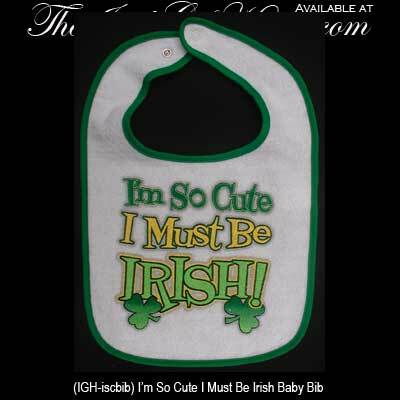 The message on this shamrock baby bib says I'm So Cute I Must Be Irish. The Irish bib is received with a shamrock history card that is complements of The Irish Gift House.